Martini Kings Palm Springs Serenade Red Vinyl! 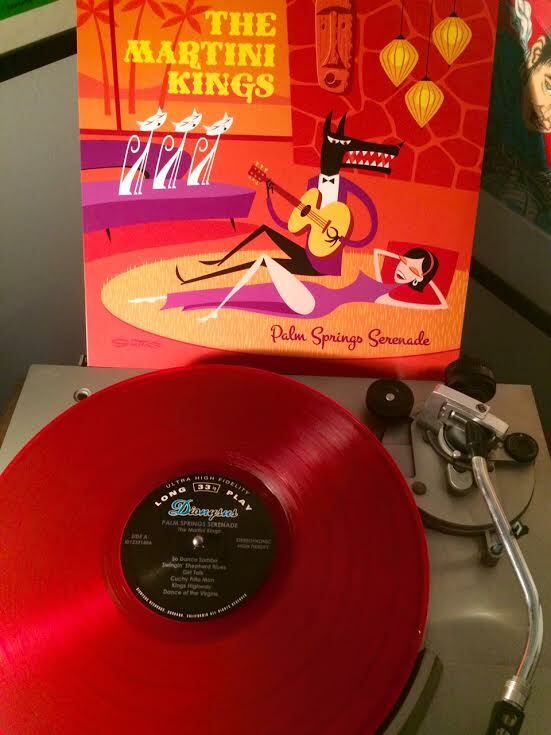 The Martini Kings only vinyl album, Palm Springs Serenade has been repressed on transparent red 180 gram vinyl! This will be the final run of this album, once these 500 LPs are gone the title will be deleted so grab now! Palm Springs Serenade is a vinyl compilation of the group’s favorite tracks from numerous The Martini Kings CDs, and features a guest appearance by Buddy Greco. The cover is illustrated by SHAG, with liner notes by Cocktail Nation’s Koop Kooper, printed on a thick, old-style LP jacket called “tip-on” which consists of slicks glued on board. The LP was cut on a vintage Scully lathe using a classic Westrex 3D cutter head. The album is packaged in a poly sleeve and includes a free digital download code. The first pressings of this LP were 400 black 180 gram vinyl and 100 clear vinyl. 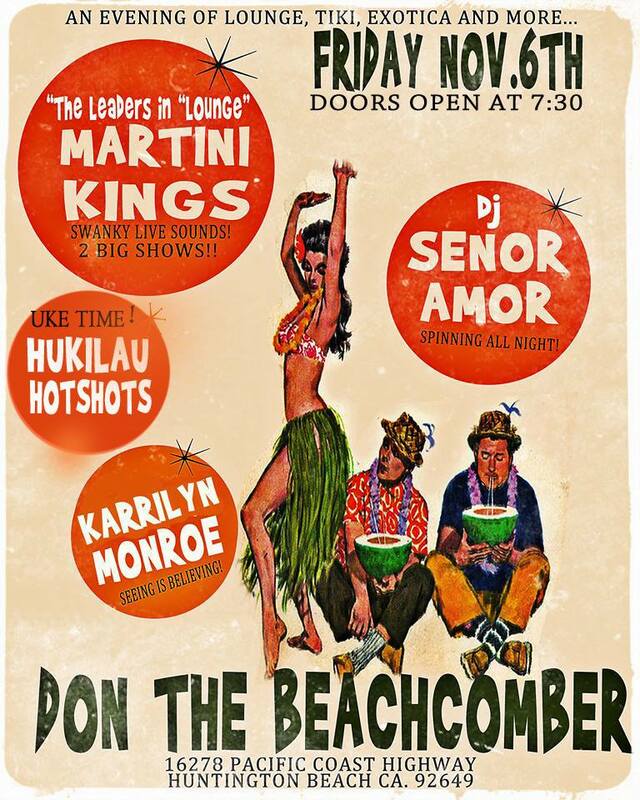 The Martini Kings will be performing at Don the Beachcomber on Friday, November 7 with the Hukilau Hot Shots and DJ Senior Amor! 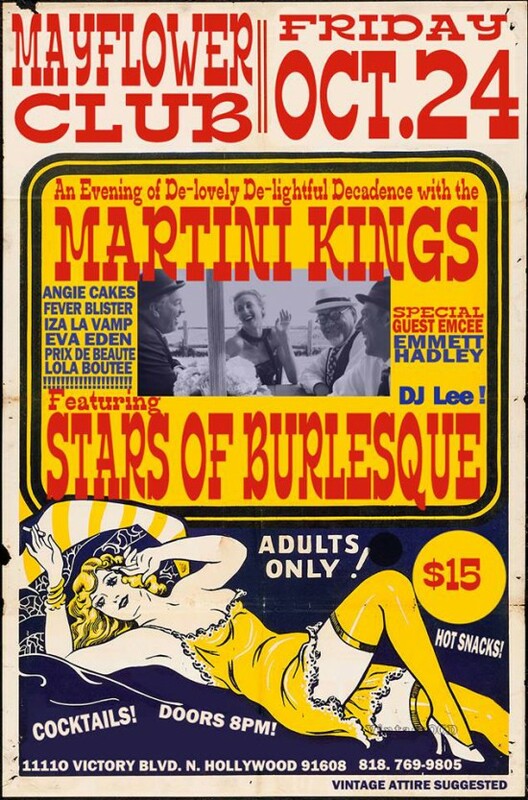 On Friday, October 24, join us at The Mayfair Club for an evening of vintage sounds featuring The MARTINI KINGS performing live with LA’s top Burlesque Gals featuring Angie Cakes Fever Blister,Prix De Beaute, Iza La Vamp, Eva Eden and Lola Boutee performing TWO SETS! Special guest Emcee Emmett Hadley plus vinyl delights spun by DJ Lee. Vintage vendors too!! Full bar, dancing, snacks, prizes. Vintage attire suggested. $15 tickets available at door.Ample free parking. 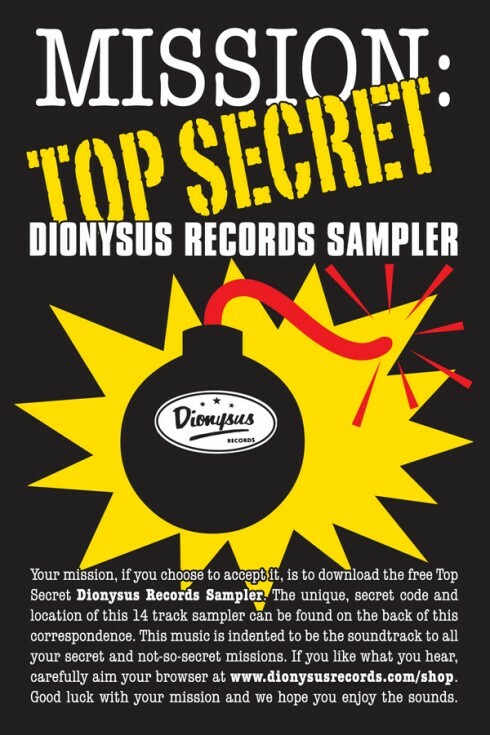 This year’s Tiki Oasis VIP Gift Bag (handed out upon check-in at The Crowne Plaza Hotel and limited to 500) will contain this postcard which has a unique download code for the free 14 song TOP SECRET DIONYSUS RECORDS SAMPLER, featuring tracks from Stereophonic Space Sound Unlimited, The Martini Kings, Orchestra Superstring, Kava Kon, Robert Drasnin, Creepxotica, Skip Heller, Jerry Sun, The Creepy Creeps, The Satelliters, The Creatures of the Golden Dawn, Redondo Beat, and Ruby Dee and The Snakehandlers. About a week after the event ends, we will be sticking these in all Dionysus Mail-Order packages until we run out. 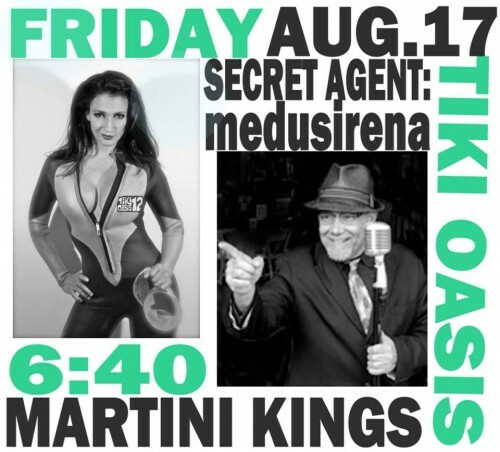 This Wednesday, August 15, 3 PM – 5 PM Pacific, tune in to Lee Joseph’s “Over Under Sideways Down” on LuxuriaMusic.com for a special show featuring Tony Marsico of The Martini Kings who will be playing the Tiki Oasis main stage – Friday, August 17 at 6:40. Lee and Tony will discuss Mission: Tiki Oasis 12, The Martini Kings, their new Dionysus Records release “Palm Springs Serenade,” their new self-released CD and back catalog, and some of Tony’s fabulous history playing music with the likes of The Plugz, The Cruzados, Bob Dylan, and others!